Just three days before Shadow is due to be released from prison, his wife Laura dies in a car accident. Aimless without her, he is persuaded into employment by a mysterious and magical man named Wednesday. On a road trip across America, they stop and visit Wednesday's various acquaintances and colleagues. And gradually we learn that Wednesday's business involves a war of gods. You see, in this world gods exist because people believe in them. So as immigrants spread out across the United States through history, they brought the gods from their homelands with them. Now, these ancient gods are in conflict with the new gods of America (media, technology, drugs). Acting as Wednesday's bodyguard, Shadow becomes involved in a mythic battle of epic proportions. First off, this book is really long. I read Gaiman's preferred text, which adds another 12,000 words to the already lengthy novel. And like always (excepting Harry Potter and a few choice others), I desperately wanted about half of this tome edited out. I don't think the story deserved 500+ pages, but I pushed through it because I loved the concept. A world where gods exist (and in a realistic, dark, gritty way) is just a fantastic idea. It all comes down to those two things for me. The concept is solid and interesting, but the length ruined it. It felt drawn out and I got bored with all the traveling and meeting of gods. If the plot had been a bit tighter, I think I would have really enjoyed it. 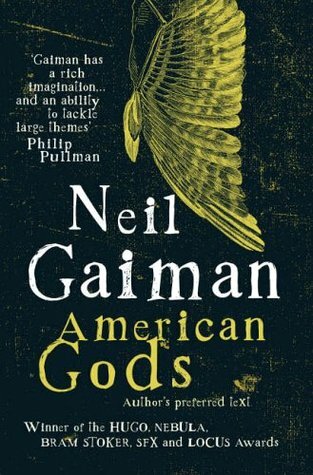 I'm still excited to read more of Gaiman though. He's got a great imagination. VERDICT: 3/5 stars. Darkly imaginative but much too long.